From time to time I mention some younger friends of mine, Emily who is five, Gabby who just turned ten, but there is one I haven’t mentioned, his name is Kingston. Kingston will be eight next Sunday. He is a very smart, athletic little boy, but he also has a problem with bad dreams. One of the things I did for my own kids when they had bad dreams was to create a “Dream Pillow”. Created from muslin and filled with good smelling ingredients, and a hand painted cover, I convinced them that as long as the pillow was in the bed that they would have good dreams. As an extra measure I shook a little Lily of the Valley dusting powder at their feet, although to them it was “Fairy Dust”. I made Emily a pillow last year and passed the fairy dust on to her, but Gabby and Kingston’s Mom is no longer alive. They have no one to sprinkle fairy dust. I plan on making them both a pillow, but as of late Kingston is having some bad dreams about dinosaurs. I tried to convince him that it isn’t at all possible for a dinosaur to get him, but he is by nature a worrier. I will see Gabby and Kingston tomorrow for our regular standing Tuesday and Thursday breakfast dates. For my piece of art this evening I decided to create something to ease Kingston’s mind. A drawing that strays a little from the norm for me, more children’s illustration, storybook style. 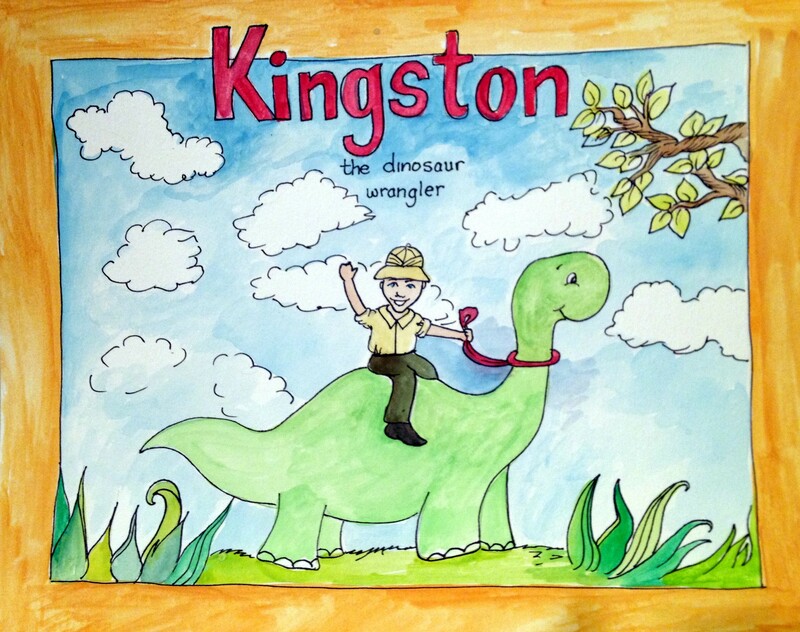 I thought that maybe if the last thing Kingston saw at night was a picture of himself wrangling a dinosaur he might feel a little more brave in his dreams. If there is one rule in life I believe in, it’s that anything you can do to make someone else have a better day, or in his case, a better night, you should do it. Kingston and “friend” in watercolor. This entry was posted in art, Art and my life, Drawing, Fine Art, Friends, Painting, Uncategorized, Watercolor, Writing and tagged art, Fine art, Friendship, loving words, projects, thoughts, Visual arts, watercolor. Bookmark the permalink.